What we're looking at here in theory is radar returns from birds flying over doppler weather radar stations. The patterns that shows up are circular because the radars are based near major cities and do not cover the entire country. Activity seemed to be very heavy last night in Nebraska and this could be the snow geese moving though. Are all those doughnut shapes around cities really birds? 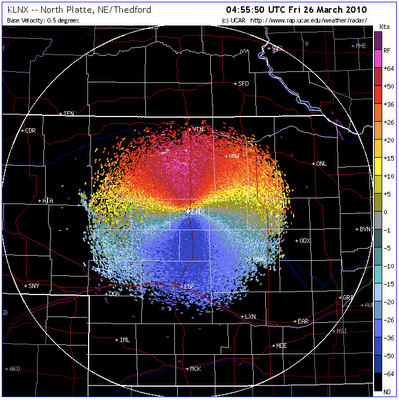 One way to get an idea is to look at a different radar product. The radar can also show us the relative velocity of the objects being tracked. In other words, are they coming toward the radar or away. If these are migrating birds we should see them all heading north. 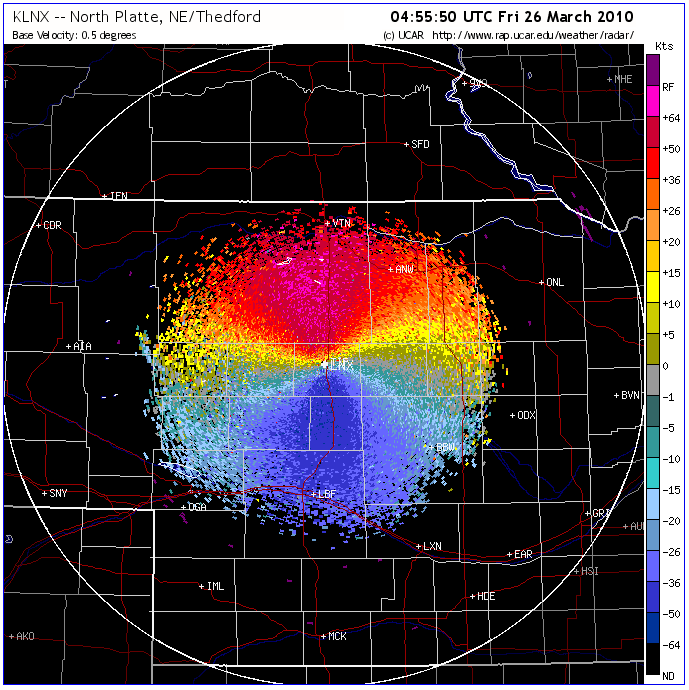 Check out what was visible last night on the radar in North Platte NE. Everything in blue is moving toward the center and everything in red is moving away. in other words, everything is heading north. Of particular interest to local Twin Cities readers is that we seem to have not had much migrating in last night. Perhaps tonight that will change. There was a very strong wind out of the south today. I saw my first Trumpeter Swans on the lakes at the nature center. Wood ducks showed up today as well. I'm Professor (Brazil), with degrees in Biological Sciences and Chemistry. I'm invading your page to spread the Verde Vida (GREEN LIFE). We posted pictures of birds and simple texts. Visit and leave your opinion.